The 29th EGP Council, the last Council of the European Green Party before the decisive European Election in May 2019, took place in Berlin from November 23rd to 25th. 100 Delegates from all parties of the European Green Family came together to elect their lead candidates and vote upon the EGP Common Manifesto and Campaign Plan. We, the team of the Ecosprinter, mingled among the delegates and activists, did a twitter live-report to keep European Young Greens updated and visited the lead candidates debate and press conference. #EGP29 started with the ones who are there before an event begins and are still partying when everybody else went to sleep: FYEG. The Federation of Young European Greens organized the Youth Event “Europe at the crossroad – how can progressive forces ally to change Europe?” the evening before the official start of the Council. Panel speakers Ruben Neugebauer, spokesman of Sea Watch -and the sea bridge movement- and Zuzana Pavelková, spokesperson of FYEG, discussed urging questions about the cooperation between progressive movements and parties and how to bring social, ecological and inclusive politics forward. On Friday morning, the Council was opened by EGP Co-Chair Monica Frassoni and German Greens Co-Chair Annalena Baerbock – unfortunately without the Co-Chairs of the Turkish Green Left Party, who were stopped at the Airport and got their passports confiscated without any court decision. Green leaders from all over Europe debated the draft manifesto. Katri Ylinen, Co-Spokesperson of FYEG, delivered a speech about the Green wave in Europe, how it is carried by young people all over Europe and how FYEG is putting out a challenge to Green parties to have young people high on lists in the European elections. A highlight of the day was the debate of the Green lead candidates Petra de Sutter, Bas Eickhout and Ska Keller. The topics ranged from the Paris Agreement, a social European Union, Rule of law and democracy, arms exports to the global compact on migration. But the more the candidates talk, the more it was getting obvious that that the three politicians on stage had a lot of respect for each other and that they pretty much agreed on the way to go forward. It resulted in the audience questions about differences between the candidates, that the Ecosprinter tried to answer beforehand with its Interview. The candidates answered highlighting the high coherence of the green Group in the European Parliament and that Greens agree on the goals, but debate on the strategy to reach them. The debate got closed by reading out an audience tweet about changing the lead duo to a lead trio, followed by a big round of applause. Saturday started with a workshop session and the plenary session: “Meet Bündnis90/Die Grünen”. 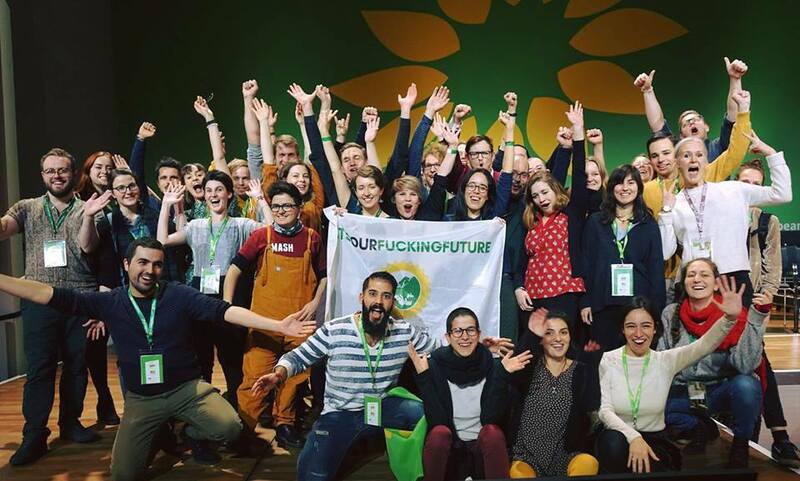 Or, to be more precise – meet German Young Greens. The panel speakers were the former young green spokesperson Jamila Schäfer, the current co-spokesperson Ricarda Lang and young green state parliament deputy Aminata Touré and two speakers representing the party leadership. The panel rocked, the speakers shared impressions of negotiating with conservatives about a coalition, being a leftist politician and a person of color, how to enthuse young people for progressive change and how they manage to include the many people who are joining Greens in Germany these days. The event was followed by a session where the Greens/EFA Group presented their achievements in the European Parliament. While we were coming closer to the election of the lead candidates, the tension was rising. In several voting rounds, first Ska Keller, then Bas Eickhout got elected by the Green delegates. They celebrated, then hold short speeches with big thanks to Petra de Sutter and find encouraging words for the race to the European Elections. The newly elected lead candidates held a press conference in which the Ecosprinter participated in. The questions ranged from “Does Macron need to fear the Greens”, to questions about Brexit, the rule of law and about green economy vs. jobs. We managed to ask one question: “What will you do to empower young people in the election, in the Parliament and as future President of the European Commission?”. The lead candidates harmonized very well and answered the questions satisfyingly. The last evening of the council got celebrated at a rooftop bar at Berlin Alexanderplatz. The Greens unfortunately opted for a posh venue and a posh party location instead of including more interested activists by lowering the registration fees, that ranged from 90€ for students to approximately 200 € for some delegates. Sunday was the voting day for the Green manifesto and resolutions of the 29th EGP Council. During seven compromise amendment sessions with tough negotiations, the amendments to be voted upon got clarified and were then selected in a several hours long voting session. FYEG had a huge impact during the whole council. FYEG Executive Committee held several speeches, many Young Greens were delegates of their parties, FYEG put forward many amendments and brought through two resolutions, one to ban unpaid internships in all European Green Parties, and another one for free internet and a fair remuneration of creators. The Council was closed by a speech of EGP secretary Mar Garcia and big rounds of applause for the organizing team. Greens may have lost a bit of their inner party debate, but this unity makes the European Greens even stronger in the fight with opposed political forces. #EGP29 showed one thing: Greens are ready for the European Elections 2019! 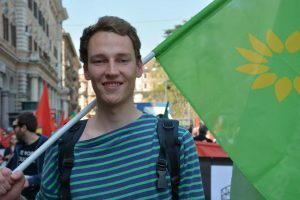 Nils Rübelmann is an FYEG and local green activist, based in Dresden, interested in Energy, Migration, Europe, Mobility and Economy. He loves trains and hates fascism. Tagged Council, EGP, egp29, European elections, spitzenkandidaten. Bookmark the permalink. minecraft: Appreciate this post. Let me try it out.